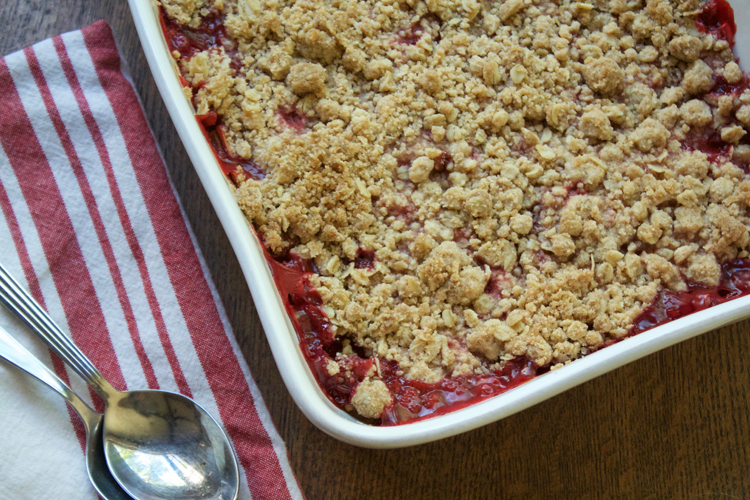 Nothing says "summer" better than a strawberry-rhubarb crumble warm from the oven. The combination of strawberry and rhubarb is a quintessential flavor of summer. 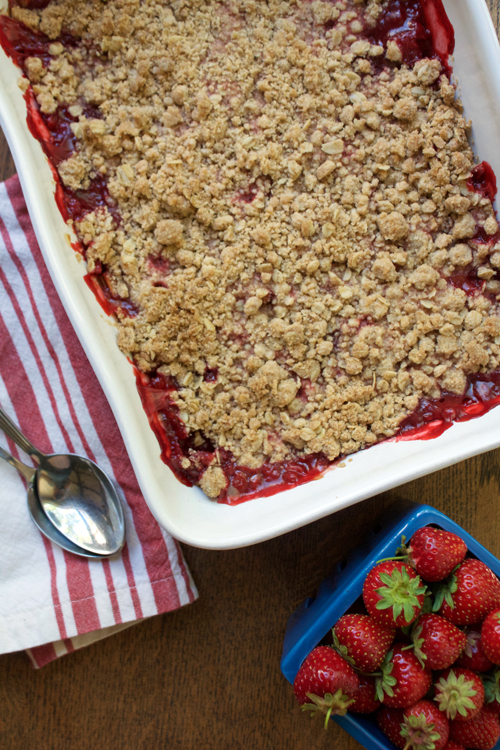 And when that strawberry and rhubarb gets covered in a delicious sugary and buttery crumble? All the better in my book. A couple of weeks ago, Dustin and I went strawberry picking at JP's Berries and Pumpkin Patch, a local farm located nearby in Tomahawk, Wisconsin. In less than 30 minutes, we picked around 9 pounds of berries. Two quarts were set aside to eat fresh, and the remaining strawberries were destined for dessert. We also picked up a couple of pounds of freshly-harvested rhubarb at the farm, so the decision to make a strawberry-rhubarb crumble was basically a no-brainer. I love a good crumble-to-fruit ratio, and this recipe delivers. The strawberry-rhubarb crumble can be served warm from the oven, at room temperature, or even chilled from the fridge. Just add a scoop of vanilla bean ice cream or freshly whipped cream and dessert is ready to be served. 1. Stir together the flour, oats, baking powder, sugars, cinnamon, and lemon zest. 2. Melt the butter over low heat. Add the melted butter to the flour mixture and stir to combine. Continue stirring until small to medium-sized crumbles form. 1. Combine the sliced rhubarb and strawberries in a large bowl. Stir in the cornstarch, sugar, lemon juice, and salt. 2. Let the fruit mixture sit for at least 15 minutes before putting together the whole dish. 2. Pour the fruit mixture into the bottom of an 9" x 13" baking dish. Make sure to spoon in any juices remaining in the bowl. 3. Top with the crumble mixture; be sure to cover the fruit mixture evenly with the crumbles. 4. Bake for 40 minutes, or until the top is golden brown and the fruit is bubbling. 5. Allow to cool before serving. Serve with a small (or large!) scoop of high-quality vanilla ice cream. This post was originally posted on June 10, 2010. The post has been updated with new content and photos.